Dan Guttmann MD is an Orthopaedic surgeon in Taos, Los Alamos and Santa Fe, New Mexico. His clinical focus is on upper extremity surgery with a special focus on the shoulder. He has been in New Mexico since August 1, 2000. He has more than 28 years of experience in his field. Dr. Guttmann is the Director of the Taos Orthopaedic Institute and the Director of Shoulder and Elbow Surgery at Taos Orthopaedic Institute. Dr. Guttmann is also Senior Faculty of the Sports Medicine Fellowship and Training Program at the Taos Orthopaedic Institute Research Foundation. He serves as a Clinical Assistant Professor at the University of New Mexico School of Medicine in the Department of Orthopaedic Surgery. He has published numerous articles within sports medicine and Orthopaedic surgery. 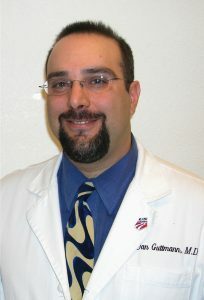 Dr. Guttmann is also a team physician with the United States Ski and Snowboard association. Dr. Guttmann currently is affiliated with the Holy Cross Hospital in Taos. He graduated from Temple University and Albert Einstein Medical Center in Philadelphia and completed his fellowship in Shoulder and Elbow Sports Medicine and Reconstructive Surgery at NYU Hospital for Joint Diseases. Additionally, Dr. Guttmann serves as an orthopedic consultant to several Northern New Mexico high schools, colleges and ski patrols. Dr. Guttmann has been a member of the ISAKOS (International Society of Arthroscopy Knee Surgery and Orthopaedic Sports Medicine) Shoulder Committee since 2011.